First, let’s go from the top down to set the context for the profile of William E. Barber. In the summer of 1950, North Korean communists launch a completely unprovoked attack across the 38th parallel against their peaceful, democratic neighbors, the South Koreans. The Americans immediately sent an invasion force by sea to drive them out. The North Koreans easily manage to take over the capital Seoul, and the allies are left with only one port in the southeast – Pusan. In September of 1950, American forces land an invasion force at Inchon, cutting off the North Korean invasion force surrounding Pusan. The North Koreans retreat, and there is hope that American forces will be home by Christmas. 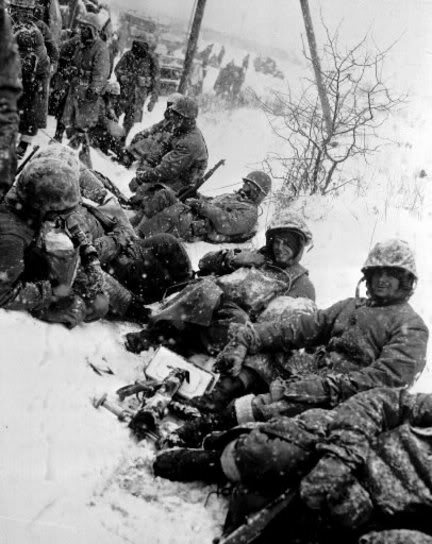 But then, unbeknownst to the Americans, the Chines communists invade North Korea from the north and surround the American forces near the Chosin reservoir, threatening to annihilate an entire Marine division. 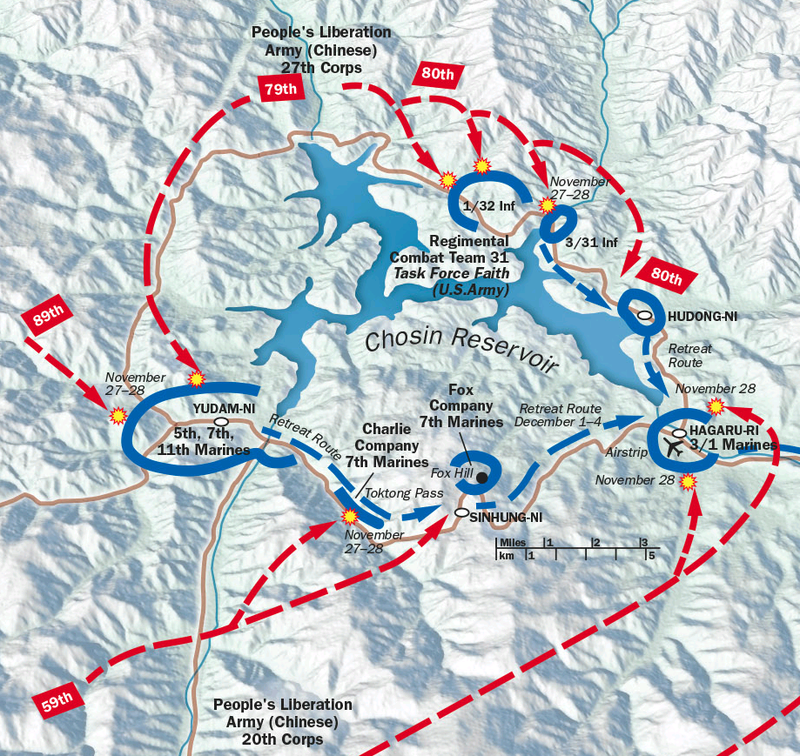 As you can see from the map, there are a whole bunch of American troops fighting to the north/east and south/west of the Chosin Reservoir. The marines near Yudam-Ni need to retreat along a road called the MSR (main supply road) back to Hagaru-Ri. But in order to conduct that retreat, they have to hold onto the vital Toktong pass, which is overwatched by Fox company from their position on Fox Hill. Can Charlie company and Fox company hold off the entire Chinese 59th division (10,000 men) with only two companies (about 250 men each)? Col. William E. Barber, who won the Medal of Honor for his leadership of a vastly outnumbered company under siege on a snowy hilltop in one of the worst defeats in Marine history, the Battle of the Chosin Reservoir in 1950, died on April 19 at his home in Irvine, Calif. He was 82. 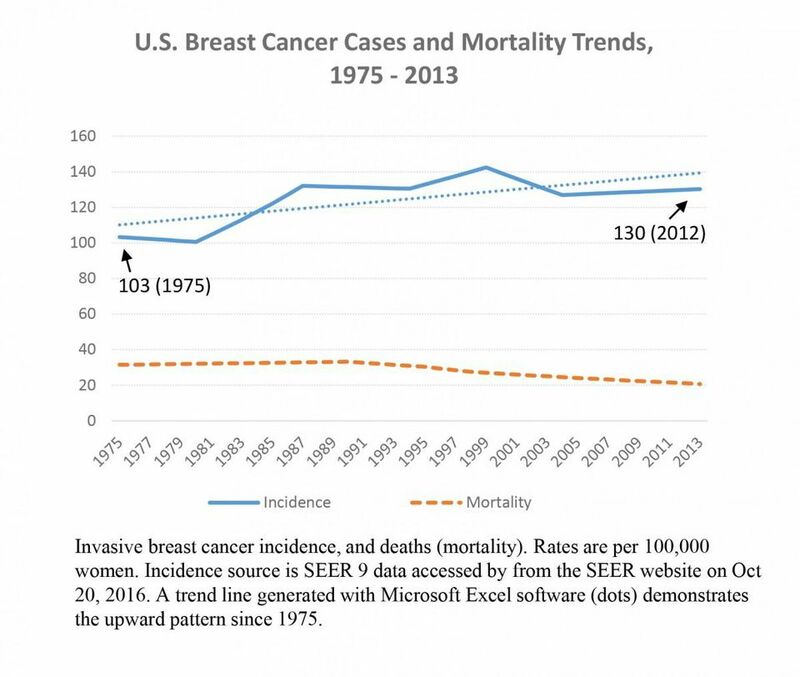 The cause was bone-marrow cancer, said Jerry Courtier, a friend who hopes to write Colonel Barber’s biography. The reservoir is south of the Yalu River, which separates North Korea from China. 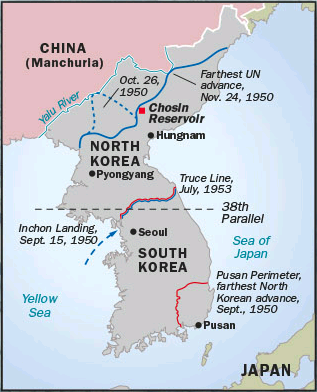 After the Americans had pushed the North Koreans almost to the Yalu, 150,000 Chinese troops unexpectedly crossed the river into North Korea. Colonel Barber’s unit, Company F of the Second Battalion of the Seventh Marines, First Marine Division, was on a hill that commanded the Toktong Pass, a vital gap between Yudam Ni and Hagaru Ri, two towns separated by 78 miles. The stakes were huge. If F Company yielded its position, 8,000 marines at Yudam Ni would be cut off from the 3,000 at Haguru Ri by tens of thousands of Chinese troops. Through five days and six nights in subzero weather and often swirling snow, Colonel Barber, then a captain, inspired his men, outnumbered more than five to one, to cling to their tenuous positions. He was shot in a bone near his groin on the second day but continued to make the rounds of the hill. He likened the wound to a bee sting. When the unit was ordered to withdraw and fight its way to safety, Captain Barber refused. Three times, the enemy broke through the line, only to be repulsed. ”I knew that we could probably hold, and I knew that if we didn’t hold we could exact a very heavy toll,” he said in an interview in 1976 with The Los Angeles Times. His citation for the nation’s top medal said that he commanded his men from a stretcher. But Hector A. Cafferata Jr., who as a rifleman won the Medal of Honor in the same battle, insisted that Captain Barber refused the stretcher. ”He walked the line, he kept us together,” said Mr. Cafferata, who was beside Captain Barber when he was shot. In the mayhem, the Chinese blew whistles, beat cymbals and tooted bugles as they repeatedly attacked. 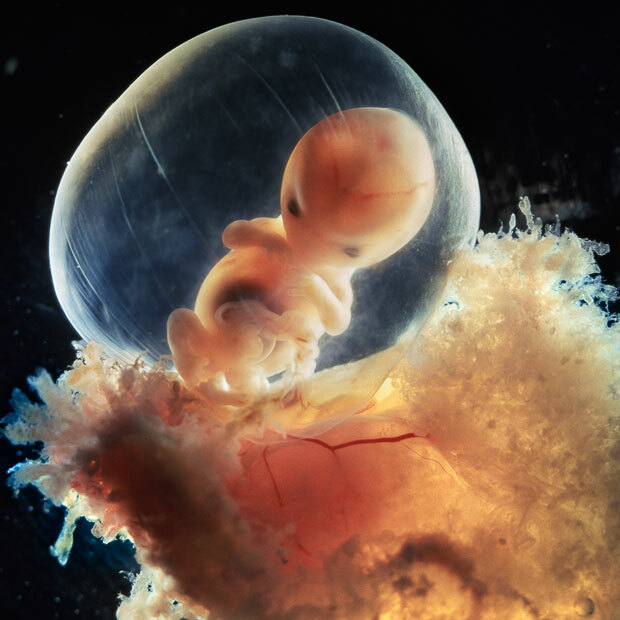 Coffee froze before men could drink it, and some of the wounded died because plasma froze with no way to thaw it. When the battle was over, more than 1,000 enemy soldiers were dead. Of Captain Barber’s original 240 men, 82 were able to walk away. Gen. Raymond G. Davis, who was a lieutenant colonel in the Marines, received a Medal of Honor for leading the unit that rescued F Company. William Earl Barber was born on Nov. 30, 1919, in Dehart, Ky. He attended what is now Morehead State University in Morehead, Ky., for two years and enlisted in the Marines, at the age of 21, in 1940. He was so good at shooting a rifle that he was made a weapons instructor. After volunteering for parachute training, he demonstrated such proficiency that he became a parachute instructor. In World War II, he was promoted to sergeant in 1942 and commissioned a second lieutenant in 1943. He was a rifle platoon commander at Camp Pendleton, Calif., when his unit was shipped to the Pacific. He was treated in Japan for his wounds and returned to the United States, where he worked as a recruiter, among other positions. He was promoted to captain in 1949 and was in the force that occupied Japan. When he joined F Company in Korea, he saw a raggedy unshaven bunch and immediately ordered the the troops to shave, shine their shoes and look like marines. He suggested that his new charges resembled Pancho Villa’s bandits. He was by the book. He enlisted in the Marines because he was grateful to his country for allowing him to escape poverty and go into college, and he wanted to give something back. You can read a review of the book I read about Fox company, and read about some of the details of what it was like for those men. You’ll never look at your own troubles the same way again. 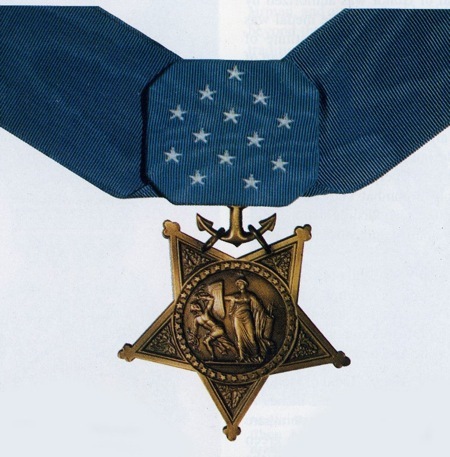 You can also read about Barber’s Medal of Honor citation here. So, now that I am done with that book, I have moved on to another Korean War book that Dina gave me, this one about George company. The Korean War might have been our most just war – defending a peaceful democratic ally from a totalitarian communist regime. You just have to compare North Korea and South Korea today to understand the stakes. North Korea is basically a godless concentration camp that tortures and murders its people if they so much as think the wrong thoughts about the atheist state. South Korea is free and prosperous, where the people have human rights, like the right to free speech and freedom of religion. It’s important for me to read about the hardships that real heroes face, so that I don’t complain too much about my own tiny struggles. When you read about the struggles of great American soldiers, so many good things happen to you. Your own problems get smaller, your humility and gratitude get bigger. And you are reminded about why America is a great country, and what American character is really like. These things are not taught by leftists in the public schools. They are not talked about by leftists in the mainstream media. They are not presented by leftists in the Hollywood film industry. If you want to know the real America, you have to find it yourself.